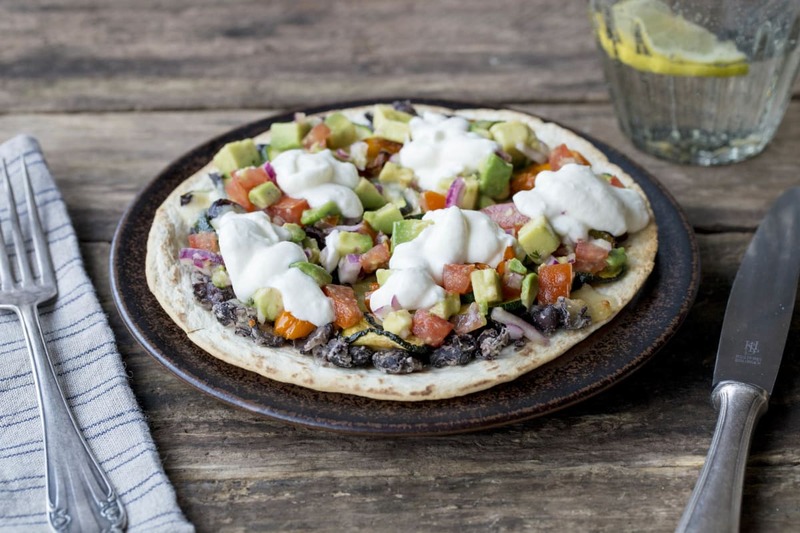 A real fiesta, these tostadas are topped with creamy black beans and cheese, along with hearty roasted zucchini and poblano peppers. Top it with a tomato avocado salsa, some sore cream, and the party's just getting started! Preheat oven to 400 degrees. 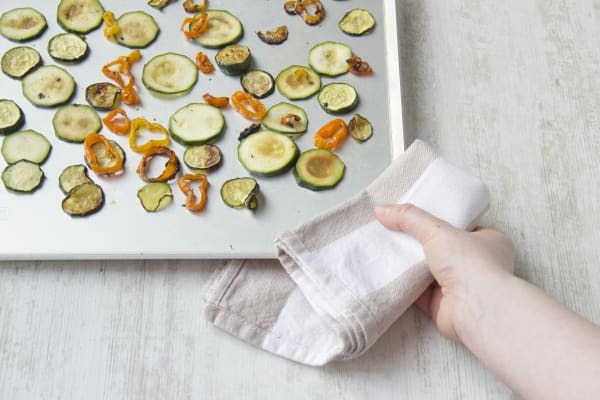 Place the tortillas on a baking sheet and bake for about 4 minutes, until crispy. Set aside. Meanwhile, slice the zucchini into 1/2-inch rounds. Core, seed, and remove the white veins form the poblano, then thinly slice. Toss zucchini and poblanos with 1 tablespoon olive oil, salt, and pepper. Spread out on the same pan you used for tortillas and roast for 20 minutes in the oven, tossing halfway through. Meanwhile halve and pit the avocado. Scoop out the flesh with a spoon and cube. Peel, halve, and finely chop the red onion. Cube the tomato, removing the tough core. Halve the lime. 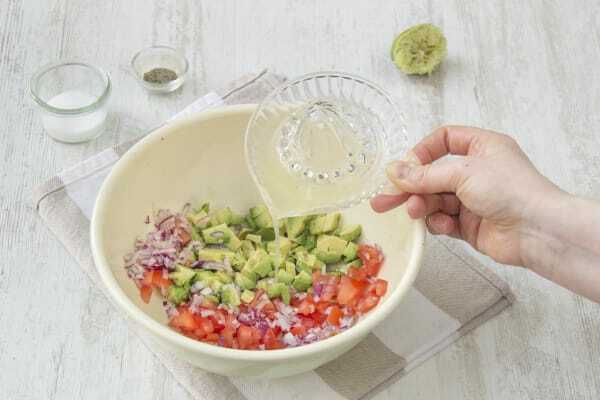 Combine the tomato, onion, and avocado in a bowl and drizzle with 1 tablespoon olive oil, juice of half the lime, and a pinch of salt and pepper. Set aside. In a small pot, heat up the black beans and their liquid with a pinch of salt over medium-low heat, stirring occasionally. Once warmed through, mash with a fork. Spread some mashed beans on the crispy tortillas. 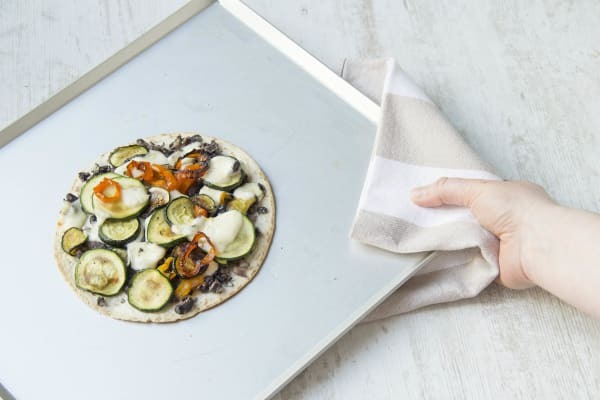 Sprinkle with mozzarella cheese and top with roasted veggies. Place in the oven for about 5 minutes, until cheese has melted. Top the tostadas with tomato and avocado salsa and a dollop of sour cream.